Your bike will perform better with this advanced ignition unit from Carmo electronics! Improved version from this well known ignition unit. Our digital ignition systems come with 3 years warranty. Production errors, quality issues and internal problems are covered by this warranty. 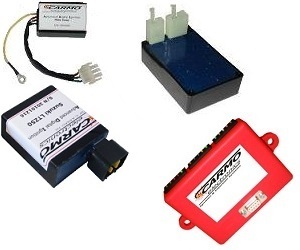 The Carmo digital ignition systems are protected against high voltage peaks, defective HT coils and reverse battery connection. Long term use of a motorcycle with faulty electronics may still result in damage to the Carmo digital ignition system. This means that without solving the electrical issue the Carmo digital ignition could break down after a while. If research shows that your Carmo digital ignition was damaged by faulty electrical parts, the warranty rights will not be valid. If this situation occurs we will attempt to repair your ignition system in order to keep the costs as low as possible. If the system is beyond repair a new product will be offered at a reduced price. Testing your original ignition module is free of charge when purchasing one of our replacement systems. During the test we are often able to find out what caused your original module to break down. This way you will know for sure if your original module really needs replacement, and you’ll be able to solve other electrical issues that may not be known yet.